•Fully Framed Structure with Architect and Structural Designed Buildings based on soil report. •Three Phase E.B. Connection for Individual Flats. •U.G. Sump (R.C.C. wall more than 13,000 liters Capacity) with separate Motor. •Common Single Phase E.B. Connection. 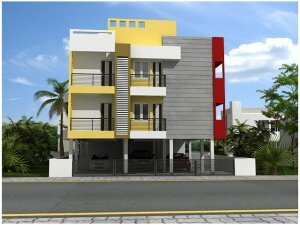 •Finance can be arranged from reputed Housing Finance Companies like LlC, HDFC, Bank of Maharashtra, Corporation Bank, Indian Overseas Bank, Indian Bank, etc. •Main door Safety grill Gate. •R.C.C. framed Structure on Columns beams and slabs supported on independent foundation. •Structural designing done by well experienced structural consultant as per soil report. •9" Brickworks - 1: 5 ratios Cement Mortar with 1st quality table molded bricks used for external walls. •4½” walls - 1: 3 ratios Cement Mortar with 8mm rods or 4½” Steel plate for every 3 layers of bricks for partition walls. •D B box with circuit breakers and 3 phase changeover switches. •R.C.C. Loft 2’ depth for one side wall only. •Cudappah shelf 3’ width and 7’ height – 1 No. •Fan point with 2 way control. •Black Granite slab with beading. •Cudappah shelf 4’ width and 7’ height – 1 No. •One metro water and one bore water tap provision. •Wash basin- Parryware White Color. •Exhaust fan provision& Ventilator with luver glasses. •Flooring - Anti-skid tiles. (12” x 12” ) (Rs.35/-per Sqft). •Main door – Teak wood frame with panel designed doors. •Main door – Eye viewer, Brass tower bolt, Bullet lock, door magnet. •Bedroom doors– Teak wood frame with designed doors. •Toilet door – Solid PVC door with accessories. •Windows – UPVC frame with fixed grills and 4 mm thick fully pinhead glassed shutters. •Interior wall fully 2 coats of putty one coat of primer with 2 coats of Emulsion Painting.